So I like to play RPG campaigns like TV shows: the stories go on, the characters evolve, etc. When I discovered this line I thought it'd be perfect for telling an evolving story about how the world goes to hell and how this one group of people survive it. I want to make use of at least two of the books (Zombies, Aliens), and I think I have a pretty good way of connecting them. I'm making this post both to workshop some ideas and determine whether or not my premise is just outright silly or not, and whether or not it would make for an interesting narrative. Firstly, the zombie apocalypse. I'm considering a combination of Night of the Meteor and The Infection; Infection being the type of zombies the players would face and NOtM being the catalyst. A strange meteor crashes into Earth, releasing some kind of nasty contagion into the world. People turn, zombie story begins. Several years into the story, the human race has been reduced to a shadow of its former self. A vaccine has been developed, but it's under the control of a viciously capitalistic company who basically take control of the world by only giving the vaccine to those who submit to living in company-owned ghettos and work for slave wages and are kept in line by brutal enforcers. After years of this, rebellions notwithstanding, another strange object enters Earth's atmosphere; an extraterrestrial transport ship. Apparently cooperative, the E.T.s explain to the Dictator of Earth that the virus was an bio-engineering experiment gone horribly wrong, and the "meteor" that crashed into Earth was really a transport shuttle carrying the virus that got knocked off course and into Earth, where the virus spread and infected humanity. The only reason it took so long for Earth to be found was because the communication systems on the shuttle were totalled in the crash, and for the last X years, there had been ships going around looking for any trace of the lost ship, and here they now stand. Upon discovering that the comparatively primitive humans have already developed a vaccine for their experiment, the aliens lock down the planet, call for their scientist caste and take control for themselves, attempting to adapt the vaccine for their own race and using the already-caged human race for further experimentation. What follows is a Half Life-esque story of survival and rebellion. I'd like to throw in some Wrath of the Gods in there somewhere, but I'm not sure where it'd go. The whole thing could be analogous to the Rapture scenario, but I'm not sure where the actual rules would come in (I guess we'd have to wait for the book). What do you think? Could it work? Cthulhu would probably be a better fit, as most of the Lovecraftian "gods" are actually extraterrestrials from either other planets or dimensions. I rather like the Mythology from the "Call of Cthulhu" "Delta Green" Line, as the "greys" are actually the organic version of robots used by the Mi-Go as a means to communicate w/ humanity (as they look more human, but still a tad bit extraterrestrial). Also, you forgot about "Rise of the Machines." The Fourth Book of the line. I'm not 100% sure how to incorporate ROTM, although it could be some kind of rebellion from the government enforcer's assistant robots, or peacekeeping bots left behind when the aliens leave Earth. Either that or the alien AI rebels against the aliens, making a three way battle. Or the aliens make our own machines turn against us due to superior tech. I like your idea and think it is really workable. Possibly Rise of the AI's might be a better fit as the third than Wrath of the Gods. Machines developed by the human freedom fighters using stolen alien tech may indeed prove invaluable in fighting against the alien menace but becoming a menace to humanity as well as they become self aware and seeking their own agenda and dominance. I like your idea, but I would still argue a Lovecraftian "Wrath Of The Gods" would work as well as the "gods" of the Cthulhu Mythos were space aliens and even other aliens (The Star-Spawn, Mi-Go, etc...) worshiped them. Who knows, maybe the aliens came to "free" their gods trapped on Earth? All depends on what the OP is going for but I think there are plenty of good ideas in here for him to take his pick. I like all of the ideas presented here for combining multiple scenarios. Although I must admit, were I to do something similar myself, I'd probably make the Zombie Plague something that the aliens deliberately threw at Earth in order to weaken and divide our species prior to their own hostile invasion. The aliens make use of a robotic army since they are physically weak themselves (thinking greys here,) but then mysteriously, the robots turn against their alien masters and - while still hostile to humans - begin rising up against everyone. Finally, some kind of Cthulueqsue "God(s)" begin rising out of the bowels of the Earth to lay waste to everything and reclaim the planet as their own. ...I'd probably make the Zombie Plague something that the aliens deliberately threw at Earth in order to weaken and divide our species prior to their own hostile invasion. 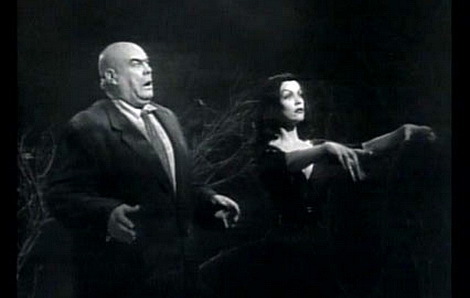 That's the plot from Plan 9 From Outer Space! Well, like the aliens said, humans have "stupid minds." 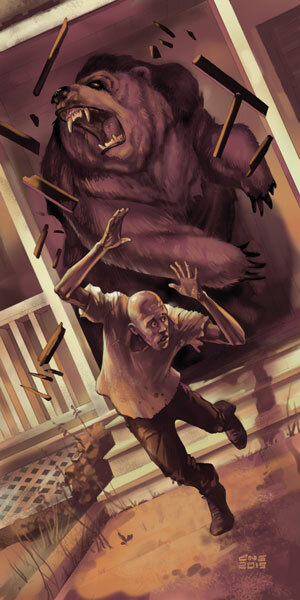 Things have gone beary wrong! If you want to incorporate the Wrat of Gods stuff in there, you can always go with their Nature Apocalypse, and say that the shuttle that crashed contained more than one type of virus. One of them would be the zombie one, but many others could affect nature differently, and thus justify the outgrowing plants and feral animals all over the place. It also puts a constant level of danger from the environment and justifies the ghettos even more. And then you can put your aliens and robots some time later as humanity struggles with zombies and nature simultaneously. I rather like Pheonix's idea. Have one virus be one that drives living fauna/humans nuts while another one reanimates them if they die. Or maybe it's the same disease and can still make it's victims dangerous, even after "death." There's this comic called Crossed. Pretty sick stuff really. Not sure you wanna use that for an RPG tough. Basically it turns infected people in the worst type of psychopathic killer. and it's infectious... Think zombie apocalypse but with those insane gangs from Mad Max.